Bennard B. Perlman: At Schenley High School, Andy sometimes had been the only student wearing a white shirt and tie; at Carnegie Tech he quickly adopted the garb of the art student: a well-worn tan corduroy sports coat over a navy blue turtleneck sweater and paint-splattered jeans. Brown-and-white saddle shoes were popular, and his were unique, painted black over the areas that originally were white. Each student’s semester grades in art were determined by the faculty in a process referred to as ‘judgment.’ For this procedure, all student works were arranged by last names in alphabetical order on a wall that ran the entire length of the building… When the faculty arrived at the end of the wall, in front of Andy’s art, a young teacher declared, ‘He’s not going to fit,’ at which point Russell Hyde responded, ‘You can’t do this. You’re wrong. I want you to give this kid another chance. Let him go and finish the summer with the class of veterans.’ And Samuel Rosenberg, like Hyde a senior faculty member, also came to Andy’s defense. Patrick S. Smith to Andy Warhol (6 November 1978): Who was your favorite or most memorable teacher at Carnegie Tech? Bennard B. Perlman: On May 29, Andy received his report card. The grades were C’s and D’s plus an R (repeat) in Thought and Expression. Accompanying it was the notation ‘Suspended until advancement in Drawing I.’ Andy took Rosenberg’s advice and enrolled in the summer-school class which was, coincidentally, taught by Russell Hyde. 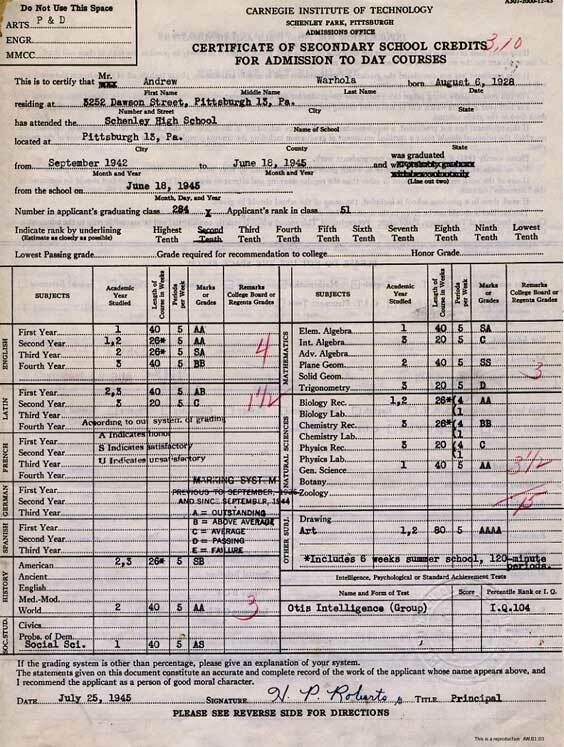 Bennard B. Perlman: When classes resumed that fall, students were urged to submit evidence of their self-motivated summer art activities in competition for a Martin B. Leisser Prize, presented each year in memory of the Pittsburgh artist who had helped persuade Andrew Carnegie to add an art school to his technical college. 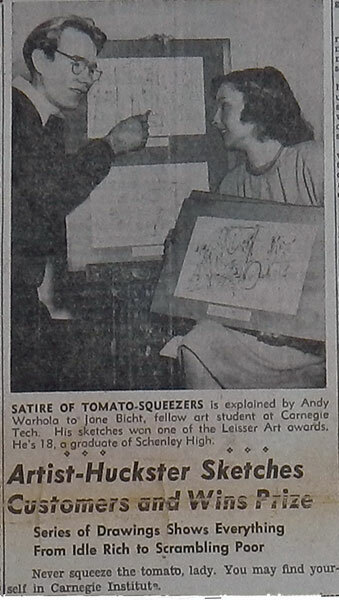 And it was Andy Warhol who was declared the winner from among the previous year’s freshman class. Jack Wilson (Carnegie Tech. student): I think Andy’s relationship with ‘Papa’ Hyde was extremely important. It is the metamorphosis of Andy Warhol. It has to do with the Leisser Prize… among the students it was very prestigious to win this award. It was a nominal but endowed prize of $50. It was awarded to a student who did work on his own – not for direct student work. And Andy won that prize for drawings.